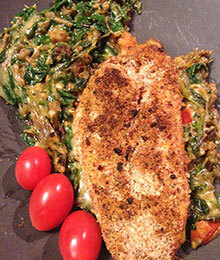 Place pepper jack cheese, cooked wild rice and cooked spinach into a large bowl. Oil a medium to large glass baking dish. Place pepper jack, wildrice and spinach mixture in bottom of oiled dish. Spread out so it's even. In another flat dish, combine the bread crumbs, 2 tablespoons taco seasoning, 1/2 teaspoon sea salt, cayenne pepper and red pepper flakes to taste to make the coating for the chicken. Sprinkle olive oil over each chicken piece so the coating will stick. 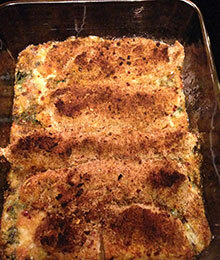 Place each piece of chicken into the coating - top and bottom, and place over spinach mixture. Bake at 370 degrees until the chicken is done, about 20 minutes. You can place under broiler for a few more minutes if you want to brown the chicken.